Solid bronze "Alpine" vessel or bowl with wood texture and blackened patina, new production. 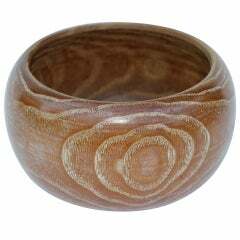 Turned from a fallen Russian olive tree, the "Alpine" bowl captures the material properties of wood and carefully preserves its beautiful intricacies into bronze. Each organic growth ring, crack and split of the wood is permanently recorded into bronze using a traditional casting method. The vessel is photographed here in our blackened bronze patina finish. Blending art and statement, we release our pieces into the world not only to accessories, but also to add function to their new surrounding. This can function as a decorative fruit bowl, flower vase / planter or simply as a sculpture to adorn your coffee table or consoles. Handmade in Los Angeles, CA from solid bronze. Custom finish options are available. Approximate accessory weight: 15 lbs. Aus einer Sammlung von handgedrehten Schüsseln, darunter einige von Edward Moulthrop, stammt diese einzigartige, handgemachte Schüssel aus exotischem Holz. Nicht signiert, aber schön.